Anybody collect or have knowledge of early NYC transit items? I have a ticket from Oct 27, 1904--the first day the NYC subway opened to the public. The number on the ticket is 4185, came out of a scrapbook, and the original owner wrote the date in the scrapbook along with a notation about either getting on or off at the 42nd Street station. Anyway--there are almost no other examples out there. 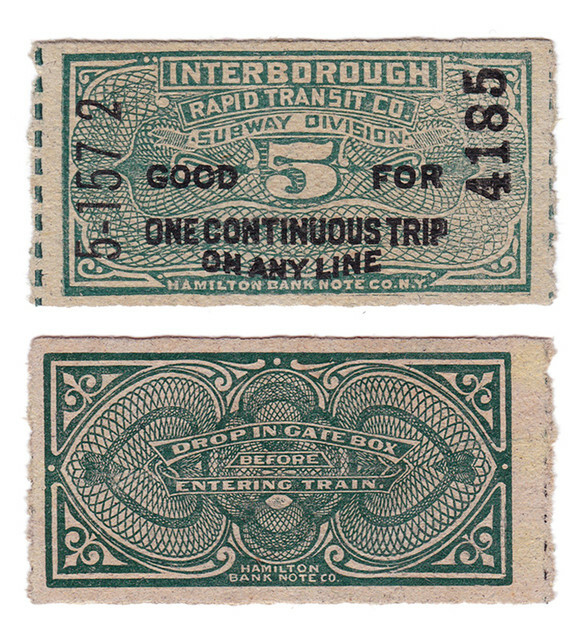 Ticket #1 is in a museum collection in New York, and there is another example in another museum that is numbered in the 13-thousands. Both of these tickets match exactly the ticket I have in style, printing, etc. It is without a doubt a first day ticket. I'd have to think it would be of interest to railroad/subway fans, and there are plenty of them. Now if you had a ticket to NYs first subway, I'd have already sent a PM even though I probably couldn't afford it. First subway what, Steve? Series? Here's a scan of the ticket, for anyone curious. The 4,185th ticket sold for the NYC subway. So far no-one I've spoken to about it, including a couple of older dealers in New York ephemera, has ever seen one this early sold publicly. It does say on the back of the ticket that you were supposed to "drop in gate box before entering train," so my guess is only a few sneaky people wanting a souvenir kept them. As I said in my earlier post, the Museum of the City of New York has ticket #1, and the New York Historical Society has one numbered 13-thousand-something. Interestingly enough, the MTA website, itself, has a slightly different ticket on its website for circa 1904. Finally, as possibly a value gauge, a dual 1904 train-bus ticket is on ebay with a BIN of $475, albeit it's been listed for a long time at that price. Jon, I think that ticket on the MTA website is actually from the 1920's. It sort of feels later, just to look at it---plus I found a reference that the BRT and the BMT merged in 1923 to form the New York Rapid Transit Company (the entity shown on that particular ticket). Also, surprisingly, subway and bus fares were 5 cents until 1948. The first subway there may not be counted by some, as it was a short demonstration line built in 1870. But it was underground, was a railroad, and ran for about 3 years. For those of you who really like old NYC subway-related trains, advertisements, vending machines, etc. ; I would highly recommend a trip to the NYC Transit Museum located in Downtown Brooklyn, NY. I haven't been there in about 5 years, so I'm overdue for a return visit. Below is the link to their website.